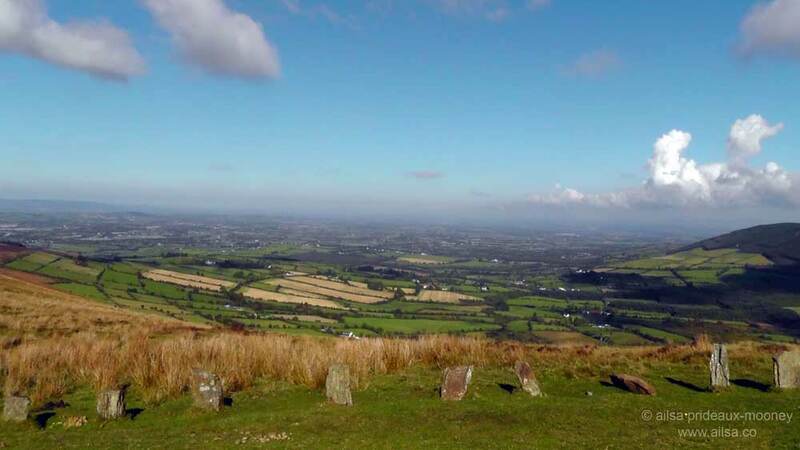 Mount Leinster and the Nine Stones | Where's my backpack? Ireland may not be home to the highest mountains, with only a select few topping the 3,000 foot mark, but what they lack in stature they make up for with their views, and the stories they inspire. The Blackstairs Mountains, like all good Irish mountains, come with a generous helping of myth and mystery. 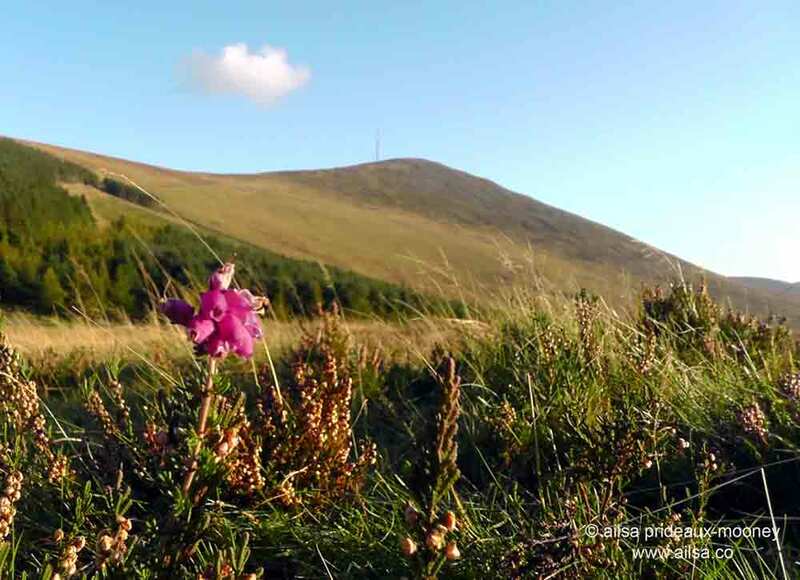 They run in a north-south line along the border between Wexford and Carlow and boast the highest peak in both counties, Mount Leinster. 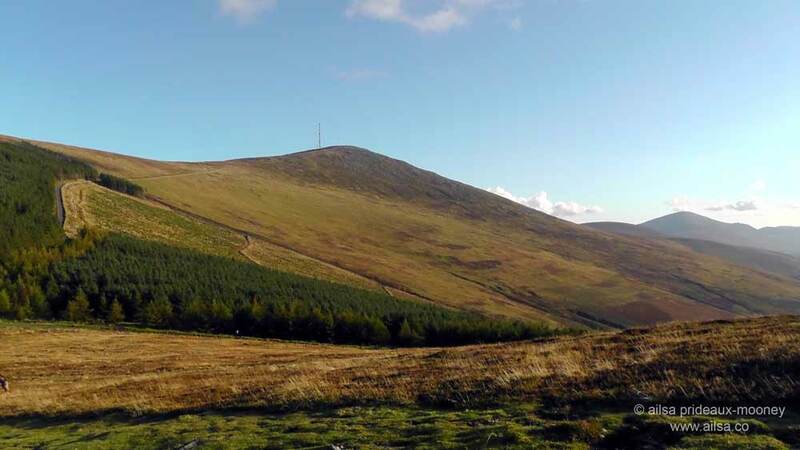 Truth be told, it’s not very high at all, measuring a mere 2,612 feet and despite its name, it is not even the highest peak in the province of Leinster – Lugnaquilla in the Wicklow Mountains is a good 400 feet higher. But something about the name of the Blackstairs has always intrigued me, ever since I had to learn the names of the mountain ranges in school. And so it happened that last weekend, needing to escape the indoor stuffiness of central heating and filled with a desire for crisp autumn air to blow away the cobwebs, I made my escape to the darkly alluring mountains I’d read about as a child. The tiny town of Bunclody straddles the Wexford Carlow border and just past the string of pastel-painted shops there’s an unmarked turnoff onto a road that leads to Mount Leinster. Within minutes I was driving through windswept heath dotted with spicy yellow gorse and pretty bell heathers. 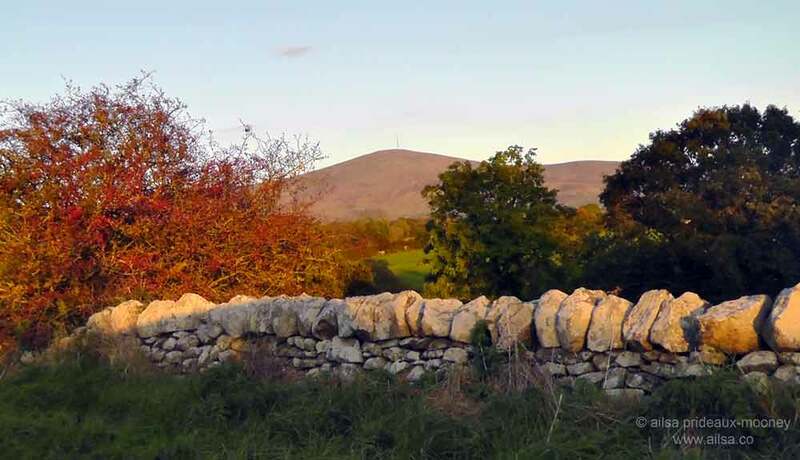 Mount Leinster peeped out from behind trees and stone walls, dominating the view. Taking a left onto an even narrower road, trees and walls fell away and my little car climbed a weaving trail that wound around the curving contours of the Blackstairs. To my right the Barrow river valley dropped away, unfurled and spread out like a patchwork quilt of fresh greens and toasted browns. Wild horses roamed the slopes in surprising numbers. Up ahead of me, a group of eight adult horses shepherded a tiny foal from one side of the road to the other. They took their time, carefully navigating the man made fences surrounding the car park at Corribut Gap, kicking their heels up in glee once they had successfully found their way back onto grassy pastures. … and suffered a most undignified landing in the nearby village of Myshall. The local cemetery still bears evidence of her fall – her knee prints are embedded in stone. 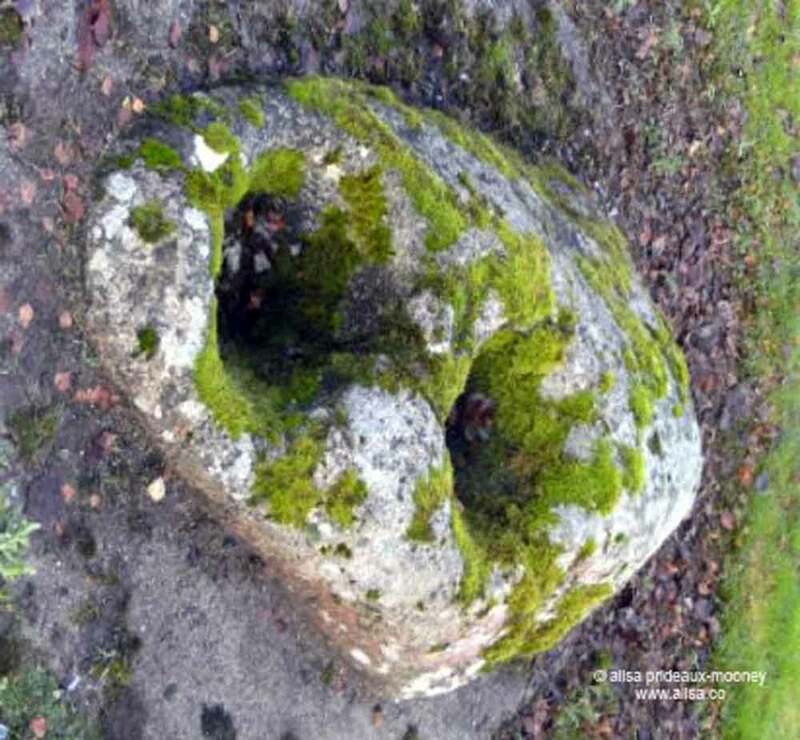 Of course, archaeologists out there will have you believe the above is just a fine example of a double bullaun stone but even so, the exact purpose of such stones remain a mystery. Variously called cursing stones or curing stones, they date back to neolithic times and carry an association with water ceremonies and the worship of the ancient deity Brigid. She ruled the Irish summertime, leaving the winter months to her sister deity Garavogue who I encountered last time on Witch Mountain. I love how these things fit together. Those witchy traces are not the only mystery in this area. The viewing area is known as the Nine Stones Viewing Point and if you look closely, a little bit up from the car park on the valley side of the road, you will see nine stones lined up along the edge of the road. Nobody knows why they are there. Some tell of nine shepherds who got lost on the mountain and were never seen again, others speak of commemorating heroes of a rebellion in the distant past. Whatever the origin, this spot offers an amazing view over eight counties and on a clear day it is said you can see right across the sea to Wales. 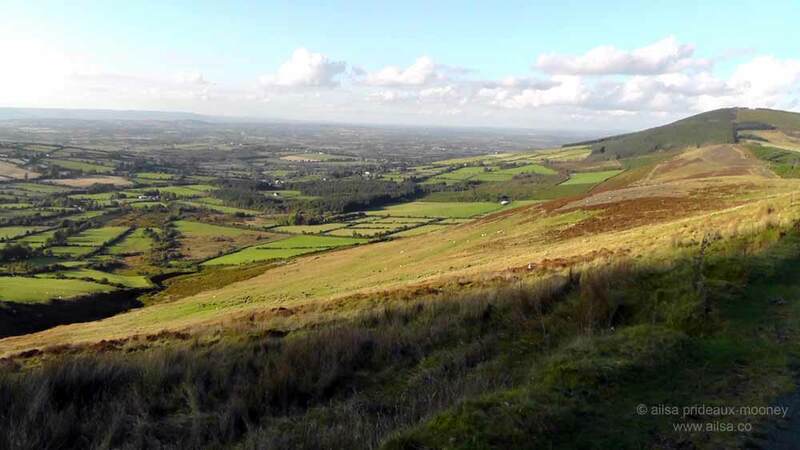 If you’re feeling energetic you can hike to the top of Mount Leinster, it’ll take you about an hour and will get your heart pumping. 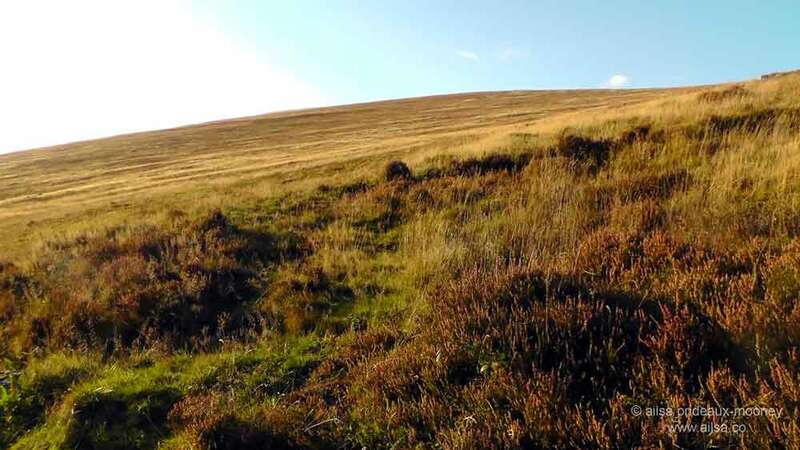 Or, if you’re wanting something a little mellower, just wander the slopes, watch the horses canter, fly a kite, or take photos of the bell heather. Here’s some footage of the breathtaking views from the viewing area. I just returned from my first driving tour of Ireland. It was absolutely marvelous! I really loved the scenery from Ladies View in Killarney. Our GPS took us on a wild ride along the cowpaths in Connemara heading up to Kylemore and Clifden. Quite and adventure. We did trek through some pretty wild paths. Great post, Ailsa. I’m fascinated with standing stones and all types of prehistoric sites. Very interesting….love the witch’s kneeholes. This landscape is so much like Dartmoor! 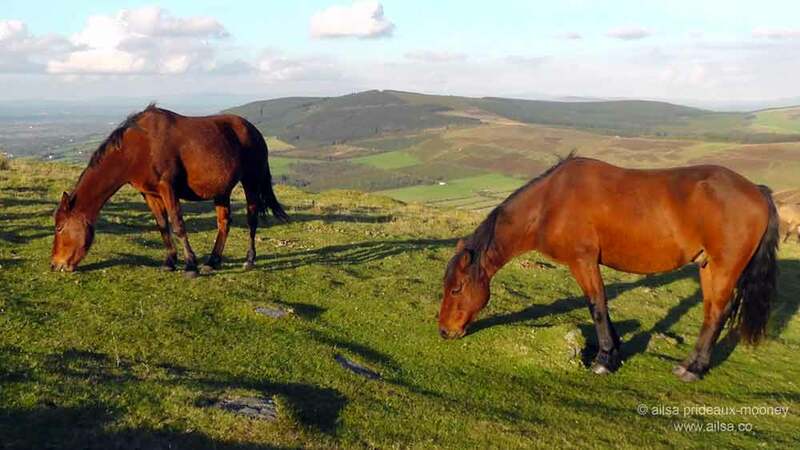 I’ve only seen Dartmoor in photos, Gilly, but it’s exactly how I imagine it to be. I love that type of countryside. I like you way have written about your journey to this mountain. The knee hole stone is really exceptional despite what the geologists say. What a lovely day tip Ailsa and I love to see the wild horses. Does any one ever capture them, or own them? 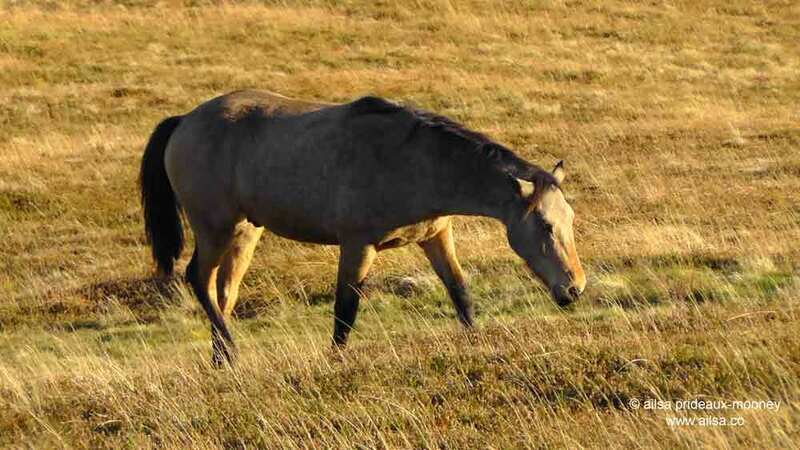 There are wild brumbies over here and every so often they have a round up and sell the young ones, or shoot them as they are considered a pest in some areas. Very sad to think of that fate for such beautiful animals.